Dart Music International (DMI) is a cultural 501(c)3 nonprofit organization that introduces the modern world to people in the USA through today's music. We assist rock, pop, jazz, blues, alternative/indie, and electronic artsits from all over the world - helping them obtain work visas, appear at cultural outreach events, and reach audiences across the USA. Since 2008 DMI has produced more than 50 free events and concert tour performances. Working with more than 250 artists, we have presented the modern cultures and countries of 40 countries from every inhabited continent - and space! In the wake of the 2017 Executive Order regarding Visas and Immigration, there has been increased public sensitivity to impacts on travelers. 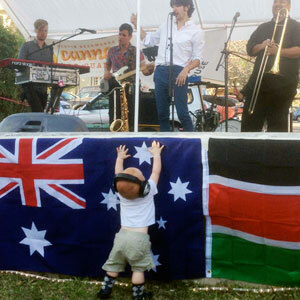 Controversy was stirred up prior to SXSW when a Brooklyn musician noticed some alarmingly harsh language in the official performing artist agreement indicating the festival could potentially report a band who violates the terms of the Visa Waiver Program. This applies to bands who choose to travel under a special "showcasing exemption" in the Visa Waiver Program that allows musicians to perform at the festival under very limited conditions. This is the reason we always advocate for bands to obtain a proper Work Visa. Many international bands experienced visa and travel issues this year, even some with Work Visas. During the Amigos Internactionales show KVUE interviewed Dave and Matthew Covey of Tamizdat about the issue. From our lineup, only the guys from Duotang experienced any extra questioning by Customs when they arrived. Our appeals to Congressman Lloyd Doggett and Mayor Steve Adler were instrumental in getting the visa application approved for Iranian rock band The Muckers as well. We will continue to work with our Government representatives, other organizations, international artists, and the public to ensure the vital cultural exchange that occurs through international music events continues. If you would like to help, please consider making a donation and/or joining our FaceBook Page. Artwork by In Churl Yo. 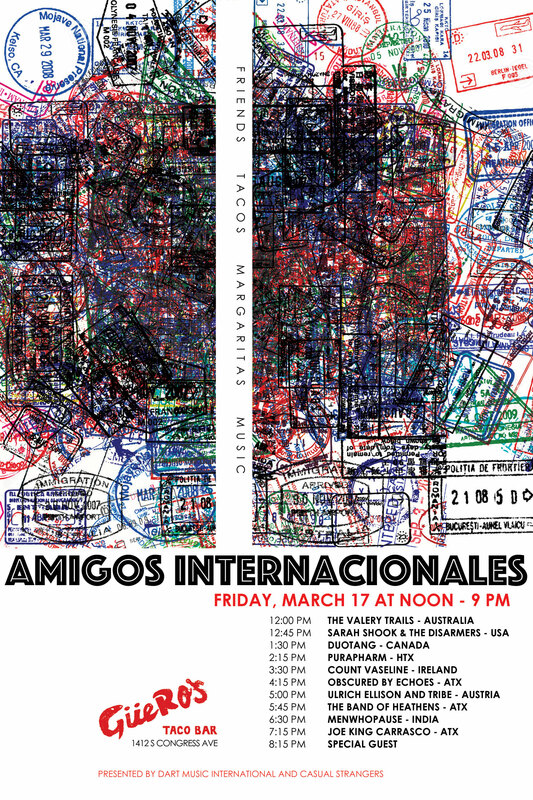 2017 Amigos Internacionales: Friends, tacos, margaritas, and music from around the world at Guero's Taco Bar Oak Garden, 1412 South Congress Avenue. We got to meet lots of friends from Austin and around the world, including great reunions with menwhopause, one of the first bands we supported back in 2008 and Rod Slaughter of Duotang, who was with us way back in 2005 as part of Novillero. The legendary Del Castillo Trio treated us to a spectacular (trio) reunion, The one and only Patricia Vonne joined Joe King Carrasco for a magical impromptu duet, and both Joe and The Band of Heathens brought Guero's Oak Garden to full capacity. Last modified on April 1st, 2017	by the Webmaster.